If your hard disk's health is not in a good state, then you may lose your important data in the future. For that reason, you must frequently take a backup of your valuable data to another storage device or media (e.g. on a USB disk, DVD, etc.) 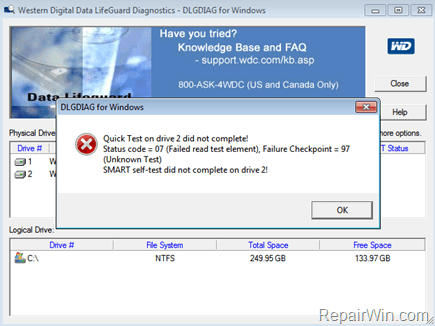 and from time to time to check your hard disk for possible damages, by using a hard disk diagnostic utility. Today all hard drives have embedded a monitoring technology called S.M.A.R.T. (Self Monitoring Analysis and Reporting Technology), that can continuously monitor hard drive's health by monitoring several parameters on the disk, like the read and write errors, the temperature, spin up time, etc. In this tutorial you can find instructions on how you can check the health status of any storage device (HDD, SDD, USB, etc.) by reading S.M.A.R.T. and how to scan the hard disk surface for possible damages. 1. Download and install CrystalDiskInfo application. * Note: If you have more than one disk on your system, click Disk from the main menu and choose the disk that you want to find out its health status. A. If your hard drive is healthy, then you should see under Health Status: Good. 1. Backup your data to another storage media/device. 2. Perform a surface scan to the drive by using HD Tune (see below) to find out the extend of damage. 1. Download and install HD Tune on your computer. 2. After installation, launch HD Tune application. If you have more than one disk installed on your computer, then use the drop down arrow menu to select the hard disk that you want to check for hardware problems. 3. Choose the Health tab to to read the S.M.A.R.T. 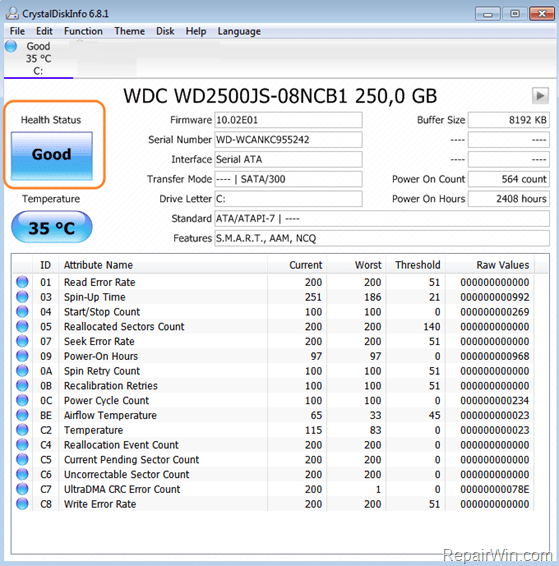 information and health status of the HDD. 1. Backup your data to another storage media. 2. Proceed to the next step to scan hard drive's surface for damages. 4. To perform a surface scan on the hard disk, choose the Error Scan tab and then click the Start button. 5. Let the HD Tune to complete the surface scan. If all squares becomes Green then your hard disk's surface is in a good condition. If you see at least one RED square, then your hard drive is seriously damaged and you have to replace it as soon as possible, to avoid loosing your files.